I have noticed that on so many of the better Tiffany pieces from the 1880 period that have come up on the market a large percentage bear French touch marks. They were obviously sold in France and most probably at the Tiffany store in Paris. I am aware that the Tiffany Paris store was very important in the last quarter of the 19th century. In fact I was told by a reliable source that the Tiffany store in Paris was treated on a par with the New York store by Tiffany and Co.
Chatting to a very knowledgeable collector who was showing me a museum piece of Tiffany from the 1880s the other day, I drew his attention to the French control mark. He shrugged and calmly said that France was where all the money was at that time and where the real collectors were. Putting it all together, I would guess that many of the important pieces were sold in France and that was mainly because the economy was not so strong in America at the time. Most people do not know that Wall street went through a terrible period in the last quarter of the 19th century. Almost 25 years ago when I was in Portobello Road in London one Saturday morning I noticed an amazing child's cup in the most amazing condition and in the original box. 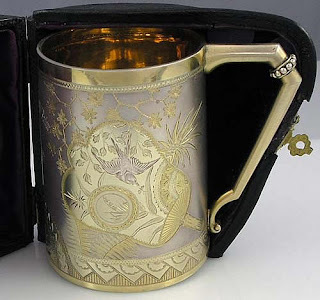 The combination of the satin finished silver areas combined with the green gold parcel gilt and engraving was a lesson in the finest engraving and the finest example of the Aesthetic Movement. I purchased the mug and went off on my way. I knew the dealer and I was surprised when a few minutes later they asked me if I would let them have the mug back because they did not really want to sell it. This happens quite often in the antique trade and it could be a case of remorse on the part of the seller or anything else that would pass through the mind of the seller after too little sleep on a Friday night before the market. I stood my ground and sounding a bit like Basil Fawlty in Fawlty Towers I said: "What is the bloody point of me looking on your stand in the first place if you want it back within a few minutes". They backed off and all was forgotten. It was not mentioned again. The cup was sold in Kansas City at a show in that same year. A few days ago I spotted the cup on the east coast and purchased it back. I recognized the inscription and the fantastic condition. Twenty Five years later I was holding something that I had owned before and it was quite an odd feeling. One realized that these trinkets will outlive us all and we have to treat them as if we are just caretakers.